Barter Books : Grand Lodge : Provincial Grand Lodge of the Far East. 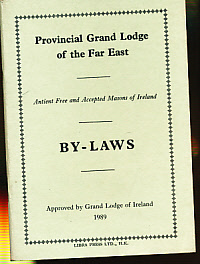 Antient Free and Accepted Masons of Ireland. By-Laws. [Dublin]: Grand Lodge of Ireland. 120 x 100 mm (5 x 4 inches) - 41pp.